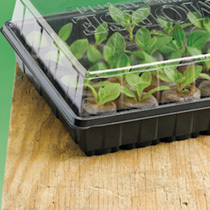 12 cell jiffy propagator with a packet of Cactus seed includes expanding jiffy pellets. 12 cell jiffy propagator with a packet of Broccoli Stromboli seed includes expanding jiffy pellets. 12 cell jiffy propagator with a packet of Cauliflower Romanesco seed includes expanding jiffy pellets. 12 cell jiffy propagator with a packet of Cauliflower Snowball seed includes expanding jiffy pellets.